After you find the page you want to optimize and run a split test on, what’s your next step? What should digital marketers specifically test on that page? You have several factors to consider in determining the features you test on a page. These elements will help you come up with the new versions, or variants, of your page to enter into the split test experiment. One way to start finding your variants is by using qualitative data, described next. Qualitative data is information that people can observe but not measure. In terms of digital marketing, qualitative data considers the users’ behavior. Gathering qualitative data is relatively easy and inexpensive, and it’s extremely helpful for picking the right elements to optimize on your page. One of the most basic types of qualitative data involves click tracking, mouse movement, and scrolling. Much of this data gets reported in what is referred to as a heat map. 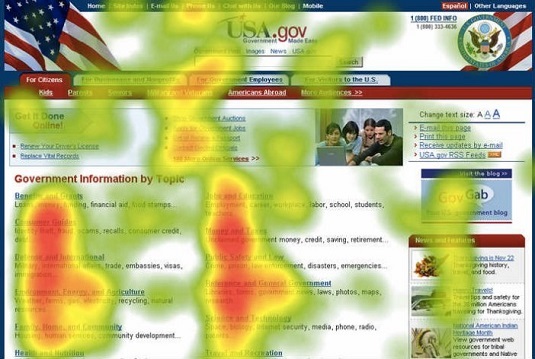 A heat map is a visual representation of a user interacting on your site; it reveals where users focus on your site. A heat map shows user interaction with your page. Running a heat map on any page you’re split testing is a good idea. Most good testing technology tools, such as Visual Website Optimizer, include heat map technology. Heat and scroll map reports can shed light on whether a call to action (CTA) is getting clicks, or whether people are consuming your content. Session recordings: Also use TruConversion to record visitor sessions and analyze those recording to find elements to test on the page. Customer service questions: Any team members who talk to customers are often a treasure trove of qualitative data. TruConversion: This suite of tools has heat maps, session recordings, user surveys, funnel analysis, and form-field analysis. Crazy Egg: Focuses primarily on heat maps, tracking clicks, mouse movement, and scrolling. UsabilityHub’s five-second test, and ones like it, are extremely powerful. The five-second test measures people’s first impressions of your site. If people can’t figure out who you are and what they’re supposed to do on your site within five seconds, you need to rethink your page.